Elizabeth Bernhardt, Actor: Casting/Show Info: Oliver! I have been cast as part of the ensemble for Theatre Tulsa's production of Oliver!, which goes onstage in March. I am excited for the chance to work with Sara Phoenix, who will be directing the show. She gave me some very positive feedback from the audition. 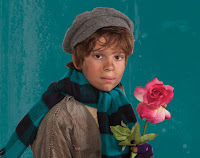 March 15-16, 21-23 at 8 p.m.
Charles Dickens’ treasured tale of the orphan boy delights with foot-tapping, engaging songs, including “I’d Do Anything,” “Consider Yourself” and “Where Is Love.” Lionel Bart’s book, music and lyrics stir the spirit and teach that each child is a gift. Theatre Tulsa enhances this classic with fresh staging, costumes and talent. To purchase tickets to the show, go here. To visit my acting website, click here.